(PRLEAP.COM) February 2, 2015 - NEO, the simple, powerful LMS for schools and universities, announced the launch of its mobile apps for iOS and Android. The NEO mobile apps allow users to access the full feature set of the site rather than a restricted subset, and includes a mobile variation of its beautiful UI design. The mobile app compliments the existing web-based app that can be accessed from any mobile browser. With the mobile apps, users can stay connected with their LMS anytime, anywhere, and have an engaging and productive learning experience. Teachers can create classes and assignments, collaborate with students, share resources, and track student progress. Students can easily attend classes, submit their assignments, and keep in touch with their teachers and friends. NEO was recently selected as one of the Top 50 LMSs for 2015 in the report "Top 50 LMS Rankings Report" written by Craig Weiss, which was based on an analysis of 642 LMS vendors from around the world. 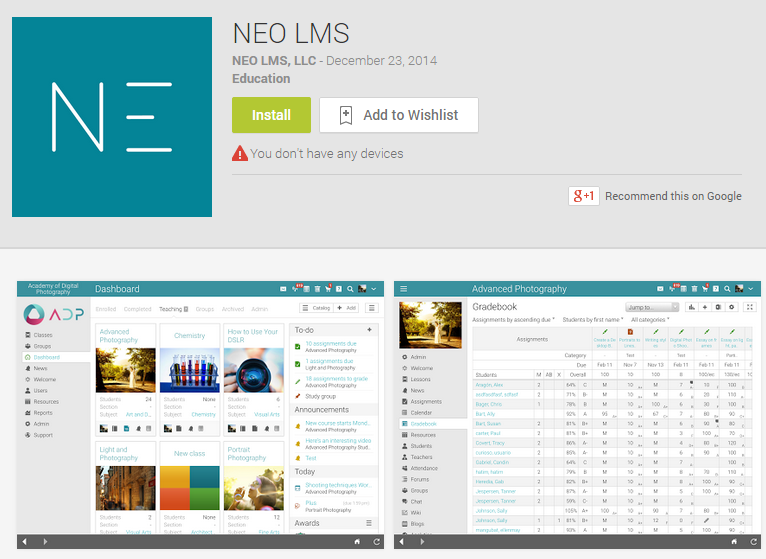 NEO is a simple, powerful LMS for schools and universities that makes it easy to deliver online education. The company was founded in 2006 by Graham Glass, the CEO of NEO and a serial entrepreneur with a track record of innovation. Graham is also the CEO of MATRIX, which provides a similar LMS for businesses.